These days I busy myself searching for how to watch Discovery Channel without cable, but when I was a kid, I spent a lot of my time watching characters like Indiana Jones search for buried treasures and discover ancient, mysterious relics. Discovery has always been something I’ve personally enjoyed so when we decided to cut our expensive, overpriced cable contract a few years ago, I wanted to know how to watch Discovery Channel without cable right away. I didn’t want to miss episodes of popular Discovery Channel shows like The Deadliest Catch, Naked & Afraid, and Mythbusters. If you’re like me and want to watch Discovery Channel without cable, keep reading. I’ll show you here how to get Discovery Channel without cable and without missing the latest episodes of your favorite Discovery Channel shows. A decade ago, an expensive cable contract or satellite TV setup used to be the only way to watch popular shows on Discovery Channel. Today, that’s no longer true. All you need to watch Discovery Channel without cable is an Internet connection and a device to watch it on. If you’ve been wondering, ‘how can I watch Discovery Channel without cable?’ here are the best ways to get Discovery Channel without cable. If you are like me, when you sit down to watch TV, you often find yourself flipping through the lifestyle and entertainment channels to find something enjoyable to watch. If that’s the case, Philo may be the best streaming service for you. For under $20 per month, you can stream Discovery Channel without cable and lots of other fabulous content. Philo TV has been an option for cord cutters since 2009 when it launched at Harvard University. While it started as an affordable option for college students, money from investors like Mark Cuban and Facebook co-founder Andrew McCollum have grown it into one of the best alternatives to cable TV on the market. If you want a solid selection of lifestyle and entertainment content, including a very reasonable way to get Discovery Channel without cable, Philo TV could be the best option for you. The only downside to Philo TV is that it doesn’t let you stream popular sports channels like ESPN or FOX Sports or local channels. Thankfully, you can get local channels for a low, one-time cost by purchasing a simple digital antenna like the Mohu Leaf. We bought two Mohu Leaf digital antennas on Amazon and couldn’t be happier. Want to know more about Philo TV? You can read all about it in our Philo TV review, which covers all the ins and outs of the popular streaming service. If you think Philo could be a good alternative for you, but are still a little hesitant, you can try Philo TV free for 7-days to test out their platform. Unlike Philo, you’ve probably heard of Sling TV before; it’s one of the most popular and well-known cable alternatives out there. Sling TV has had years to refine its platform and it shows. Sling TV provides an easy to use interface and channel menu as well as reliable streaming quality. You won’t get frustrated trying to watch Discovery Channel without cable on Sling TV. The best way to get Discovery Channel without cable is through one of Sling TV’s two packages – Sling TV Orange or Sling TV Blue. If you’re like the average American, you’re paying around $110 per month to watch Discovery Channel as part of your cable subscription. Switching to Sling TV could save you $80 per month. Just think of what you could do with an extra $80 per month. Not only will you slash your cable bill, you’ll be able to catch all the latest episodes of Planet Earth, Mythbusters, and The Deadliest Catch. Like many of the leading streaming services, you can try Sling TV free for 7-days. Learn more about the channel lineup, pros and cons and everything you can expect to experience with Sling TV by reading our Sling TV review now. We have a subscription to Hulu and we love it. We actually just upgraded our traditional Hulu subscription to Hulu with Live TV for a few months so that we could watch our favorite college football games this season and are really enjoying the live TV access it offers. Unfortunately, you can’t watch Discovery Channel on Hulu with Live TV. Thankfully, you can stream episodes of some of its most popular shows on legacy Hulu. Even better news about this option is that Hulu is just $7.99 per month – though you can often find it for $5.99 per month. Hulu owns the rights to broadcast a number of popular Discovery Channel shows, including some that are no longer airing, which makes it a solid on-demand option. If watching Discovery Channel live isn’t a deal-breaker for you, Hulu could be the right option for you. Hulu makes it easy to watch Discovery Channel without cable by putting all of its content, which includes full seasons of 28 popular shows, into one spot. If you want to learn more about Hulu and what’s in its massive library of on-demand content, read our Hulu review now. As with other streaming services, you can try Hulu Live for free for 7 days to test out the service. There’s a lot to like about DirecTV Now as a cable alternative. For starters, its menu and navigation are very easy to figure out and to use. It also offers an array of popular channels at a high streaming quality. We’ve tested the DirecTV Now platform several times and like that we can get Discovery Channel without cable through it. We also enjoy the sports and news offerings available on the DirecTV Now platform. You can stream Discovery Channel online with DirecTV Now’s “Live A Little” plan for just $40 per month. This reasonably priced option lets you watch Discovery Channel live and go back three days to watch Discovery Channel shows that have already aired, on demand. Learn more about DirecTV Now in our comprehensive DirecTV Now review. When I think of PlayStation, I’ll be honest; watching Discovery Channel without cable is not the first thing that comes to mind. In fact, TV doesn’t come to mind at all because I really only ever knew PlayStation for gaming. If gaming is all you know PlayStation for, then you will be happy to know that you can watch Discovery Channel without cable through PlayStation Vue. While PlayStation has different plans and channel packages, the “Access Plan” for $44.99 per month will give you access to live Discovery Channel content. If you enjoying watching live sporting events on TV, PlayStation Vue may be a great option for you as it includes popular sports channels like ESPN, ESPN2 and ESPNU. Another thing to like about PlayStation Vue is that you don’t need a PlayStation console to watch Discovery Channel without cable. You can watch all of PlayStation Vue’s content on your laptop, tablet or smart TV. It interacts seamlessly with Amazon Fire TV and Amazon Fire TV Stick as well as Apple TV, Roku and other streaming platforms. As with other options mentioned here, you can try PlayStation Vue for free for 7 days to see if you like it. If you’re wondering how to get Discovery Channel for free, unfortunately, there’s no good way to do it. Discovery Channel does have an app, called DiscoveryGO, but it only lets you watch shows if you have a paid cable plan. If you want to give it a shot, you can download the DiscoveryGO app and try to use your Internet Service Provider (ISP) login. While it might let you in, it most likely will not. The reality is that there’s no good way to stream Discovery Channel free. The free Discovery Channel content available through its app is limited and mostly consists of clips and bits of its popular shows rather than entire episodes. Another factor to consider is that the DiscoveryGO app only offers on-demand content. If you want to watch Discovery Channel without cable and you want access to live Discovery Channel content as it airs, you’ll need to go with a streaming service like Sling TV or Philo. If you are happy with just having access to on-demand Discovery Channel content, Hulu may be a good option for you. Not only do you get Discovery Channel without cable, you get all of Hulu’s other content, including its popular original programming like Handmaid’s Tale. Can I Watch Discovery Channel on Apple TV, Chromecast, Fire TV, or Roku? There are a number of excellent streaming platforms that make it easy to watch Discovery Channel without cable. All you need to do to watch Discovery Channel on Roku or your favorite streaming platform is to launch it, navigate to the streaming service of your choice (like Philo, Hulu, Sling TV, or Playstation Vue) and start watching. You can even watch the Discovery Channel without cable on your computer or laptop’s web browser. This means you can take your favorite Discovery Channel shows with you wherever you go – all without a cable subscription. There’s no reason to spend north of $100 per month on a cable subscription today. You can watch your favorite Discovery Channel shows without cable with any of the streaming services mentioned here. If you aren’t sure which streaming service you’ll like best, try one of the free trials mentioned above to find a platform that meets your needs. If you’re tired of overpaying for Discovery Channel and cable in general, cut the cord and put the $50+ you’ll save every month to better use. How do you get Discovery Channel without cable? What other channels hold you back from cutting the cord on your cable contract? How much money do you spend on cable or cable alternatives each month? 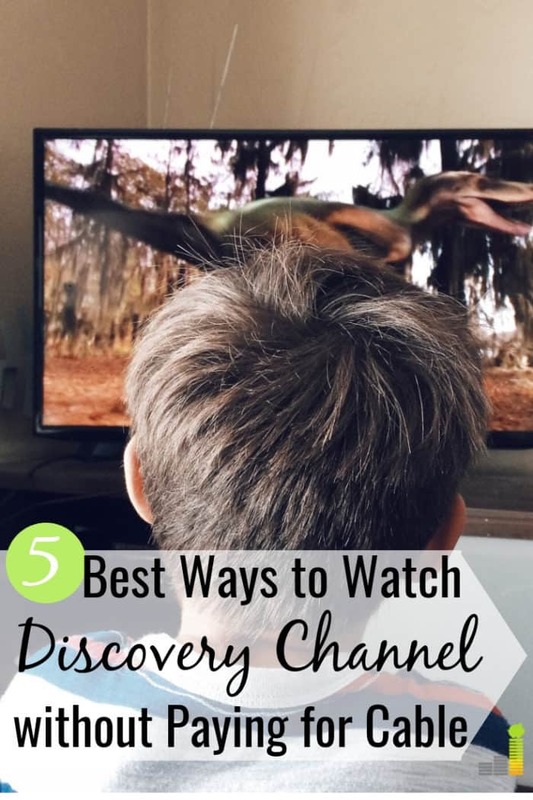 The post How to Watch Discovery Channel without Cable appeared first on Frugal Rules.